No-Knead Whole Wheat Dutch Oven Bread: Simple technique that creates a hearty, rustic bread which bakes in a dutch oven. Perfect for serving with soup or toasting up for a hearty breakfast. I am a confessed carboholic. 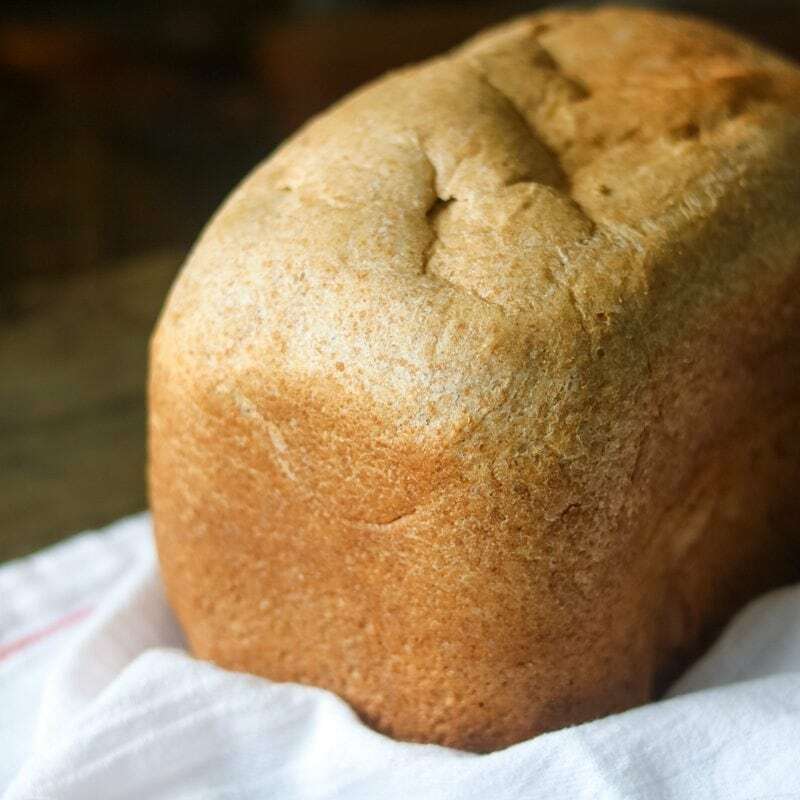 To me there is nothing better than a freshly baked bread served up with a comforting soup like Beef and Barley Soup or Corn and Potato Chowder. Heck, I don’t need Lasagna Soup or Potato Soup or ANY SOUP for an excuse to make Artisan Dutch Bread, I just need to be hungry. I am a bit of a bread snob. I want hearty, rich, and crusty bread. 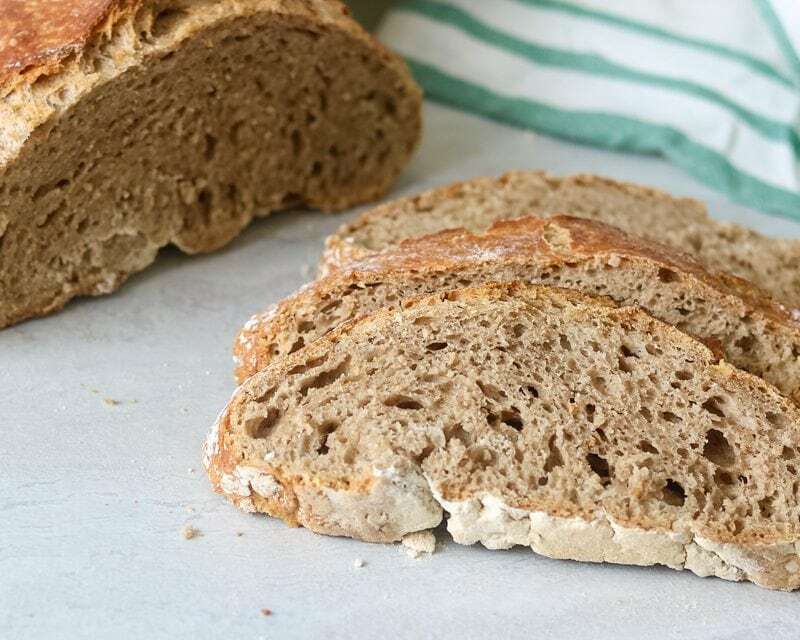 Bread that is full of flavor and texture and worthy of every calorie consumed. I want a bread that stands up to a rich soup, a thick marinara, or can be perfectly toasted and spread with jam. Okay, totally drooling right now. And confession, I don’t like to make bread. I love to bake bread–but I am not always successful at it. 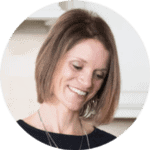 I have mastered my everyday whole wheat sandwich bread and quick breads like Spiced Apple Bread, but Artisan bread–can be tricky. I am just not much of a patient person and Artisan bread requires patience. Unless we are talking about an easy no knead bread recipe. 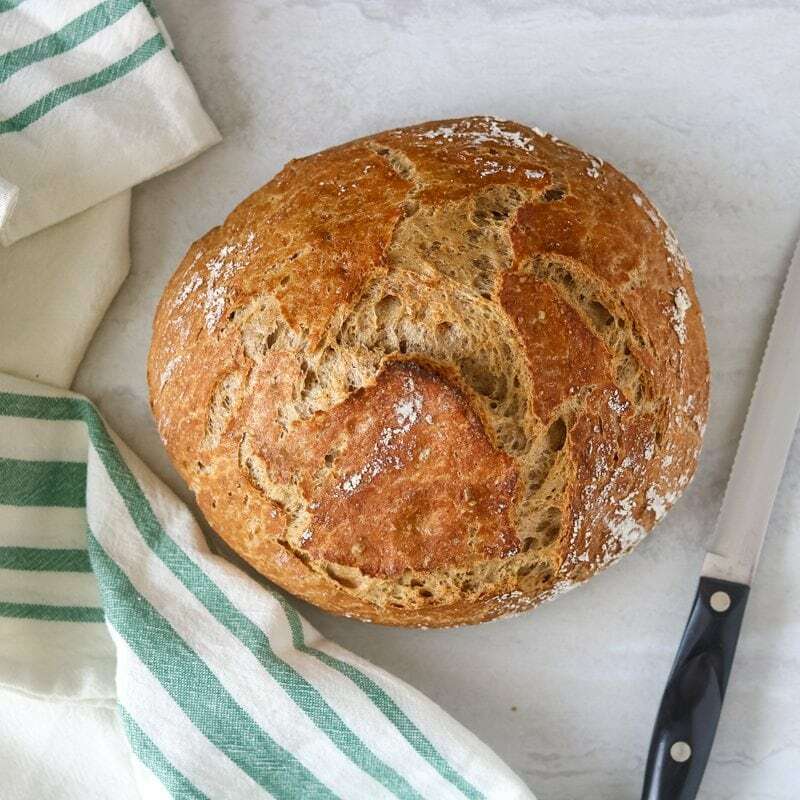 And this No-Knead Whole Wheat Dutch Oven Bread is just that–easy, hearty, delicious. And FOOL-PROOF–for me that is crucial. You too? Glad I am not alone. 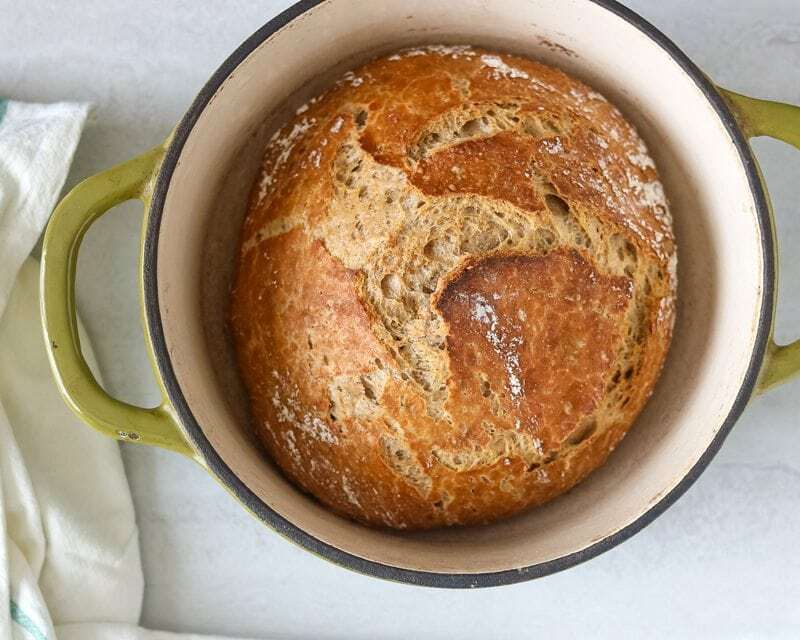 This no knead dutch oven bread is just perfection!! Crusty on the outside and tender on the inside. It reminds me of a fresh loaf of bread that I would pick up from an expensive bakery. But it is not–it is something I made with a few simple staples and hardly any effort at all. Step One: Make the no knead bread dough by mixing all the ingredients together in a large bowl. I know, hard! Step Two: Cover the bowl with plastic wrap or a kitchen towel and set on the counter to rest overnight. Keep away from any pets that may be tempted to try out the dough! Step Three: Dump onto a floured cutting board and shape into a circle. While you are doing that, also preheat your oven with your dutch oven in the oven as it preheats. Step Six: Let cool and enjoy! You will know your bread is done cooking when it reaches a temperature on an instant read thermometer of 207-209 degrees. I use whole wheat flour for this recipe, but you can use half whole wheat and half all-purpose or whole white wheat flour as well. Use regular active dry yeast, not rapid rise or instant yeast. Do NOT forget the step to preheat your dutch oven in the oven while the oven preheats, that is crucial to achieving the right texture. An easy dump stir recipe for rustic bread. Mix together water, salt and yeast in large mixing bowl. Mix in flour until well combined. Cover and let sit out overnight. The next day, place a dutch oven in oven and pre-heat oven to 450 degrees.Once heated, carefully remove dutch oven. With floured hands, shape dough into circle. And drop into skillet. Bake covered for 30 minutes. Remove lid and bake for an additional 20 minutes. Remove bread from dutch oven and let cool on wire rack for 10-15 minutes before serving. 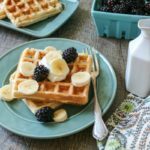 I use whole wheat flour for this recipe, but you can use half whole wheat and half all-purpose or whole white wheat flour as well. 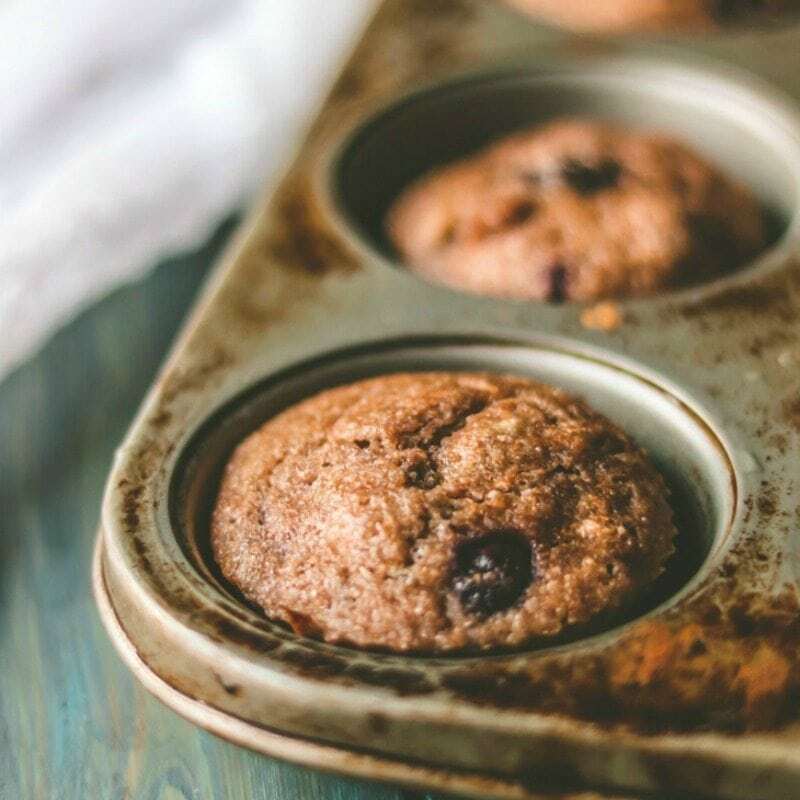 If you use all all-purpose flour you will need to use 4 cups instead of 3 3/4 cups. Sometimes I think you are reading my mind. I was just thinking about making a no knead bread for my mother in law’s birthday on the way to my computer! I have never used whole wheat flour before and I’m not much of a baker. Does it work differently than regular flour? I guess I mean is the consistency different? I’d love to make this for my son’s lunch. So glad I can be your mind reader, Denise!! Whole wheat flour is different–heartier and typically denser. You can make this with all-purpose flour as well with the same ratios. But I would suggest half whole wheat, half all-purpose and work your way (or your son’s way) into 100% whole wheat. And I bet your mother in law would love this! 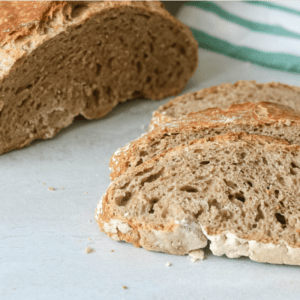 How cool is this – just 4 ingredients and NO KNEAD!!! 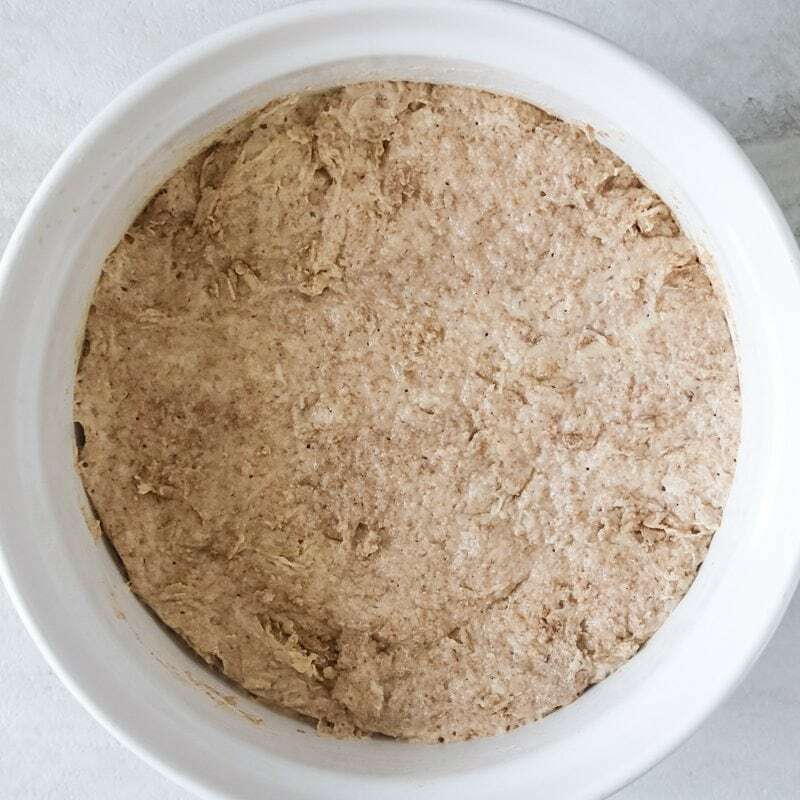 My daughter and I used to make bread often – but don’t seem to have the time to sit around waiting for it to proof – so I am loving this overnight dealio! I could do that for sure! Thanks so much for sharing this one Kristen! 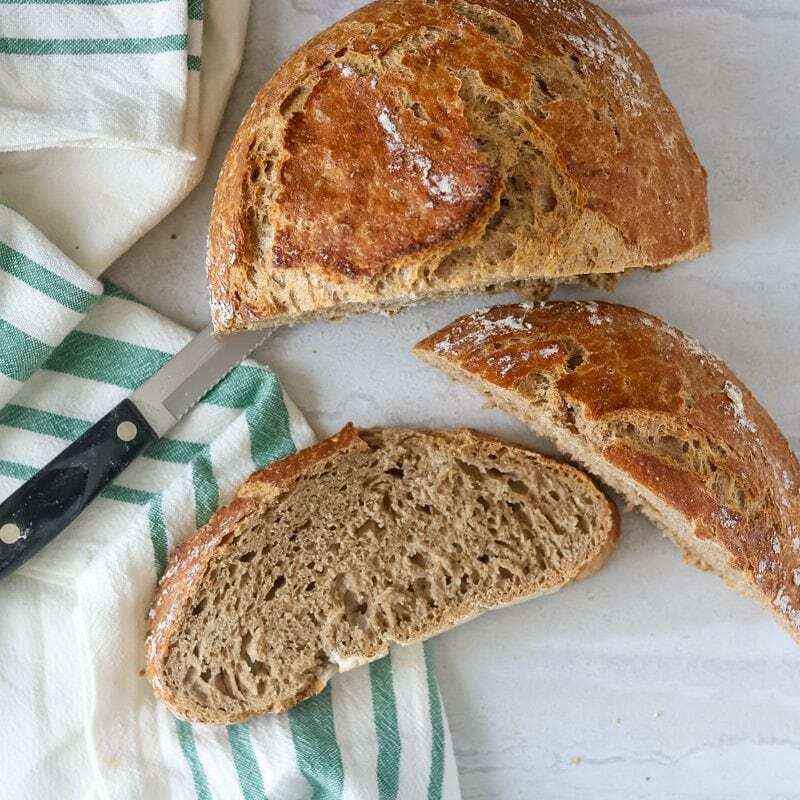 I’ve seen the odd similar recipes recently and keep meaning to give one a go as there’s nothing quite like homemade bread but it can be a little time consuming. This looks and sounds great, must try! What a gorgeous loaf! I love making yeast bread, this is a real winner Kristen! Nothing is better than freshly baked bread, I definitely need to try this, it looks so crusty and amazing! I’ve made the no-knead bread like this many times at home and I am so impressed with how this turns out. It’s just like the pricey artisan bread at the bakery. I’ll have to try your whole wheat version. What kind of yeast do you use? I have active dry yeast. Does it matter? Yes Valerie, active dry yeast works perfect! My cast iron Dutch oven is not enameled. Should I put some oil or butter in it before adding the bread dough? Yes, just a light brushing of oil will prevent sticking. Maybe whole wheat requires a bit more hydration. Depending on your elevation or the humidity in the air, sometimes you may need to add 1/4 to 1/3 cup more water to your dough. I am going to watch for a dry day here and play with this recipe again to be able to better offer trouble-shooting tips for you. Hi Mimi. You would use regular yeast (active dry) for this bread (NOT instant yeast). I have the dough resting right now to bake tonight–high time these pictures are updated and we are having soup tomorrow night that this bread will pair perfectly with. Enjoy! My Dutch oven is oval and I wonder if its’ Size and shape will mean baking time should be adjusted. What is the diameter of your Dutch oven? Thanks! Is it possible to do this with rye flour?? Hello! I would like to use this recipe but just using my starter and not yeast. Do you happen to know how much longer would it need to rise? Thanks! Hi Fiona! I have never tried this recipe with a starter in place of yeast. However, I would think 24 hours would be sufficient. That is double the time for traditional yeast, and should work out! If you try it, let us know how it goes so others can learn! Thanks! Hi, this looks lovely. Planning to try out tonight. Can you confirm approx how many grams is 1 cup please? Hi Sam, I hope you weren’t waiting up last night for my response–I am in bed early! HA! 1 cup is 128 grams. Hope that helps and you enjoy! Approx how many hours of rise time do you recommend? I’ve made other versions of no-knead bread and times vary. Hi Mame–I let this sit at least 8 hours. I usually make when prepping dinner, and then leave sit out overnight and bake in the morning, for me, that is about 12 hours. Can this bread be baked in a round covered casserole dish instead of a dutch oven? Hi Mary! As long as your casserole dish is deep enough and can be heated up to 450 degrees, it will work perfectly. I have never used a Dutch Oven before, so I am wondering, what size you use? I will need to buy one. Hi Pam! I use a 6 quart dutch oven. Here is the one I use https://amzn.to/2PEvduC (which is an affliate link) but you can buy them at Walmart even 🙂 I just baked a batch today for soup we are having tonight. Enjoy! I had my first ever attempt at making bread using this recipe and it turned out incredible. I added 2TBSP each (pumpkin seed, sunflower seed, white and black sesame seed) to the mix and an additional 1TBSP of each to the top. My question, how long does this recipe keep for once cooked and what is the best way to store it? Thank you for the great and simple recipe and I’m excited to delve more into the world of no-knead bread. Hi Weston, your additions sound FABULOUS! I would store this bread (once fully cooled) in an airtight container at room temperature up to 3 days. I have had it last longer, but the taste is diminished. If you have more than you need in 3 days, I would slice and store in freezer safe bag for up to 1 month–it toasts well from the freezer or makes a great base for french toast. Enjoy!!! Since I am cooking for one, I will likely freeze half the loaf once it cools and store the remaining half in an airtight container until I go through it. Have you had issues with mould growing in an container? I’ve read so many different opinions on how to store homemade no-knead bread (in a linen cloth, plastic bag, paper, bag, container, fridge…). Do you find the airtight container helps keep it from going stale and does it keep the crust pretty hard? Last question, have you ever turned this recipe into individual rolls instead of a whole loaf? I’m curious if it’s possible and how much to reduce the cook time both covered and uncovered. You should be good 🙂 As for individual rolls, I would proceed with recipe as stated, but after dough has risen overnight, I would roll into 8 individual rolls and then gently place into the heated dutch oven. Bake for 30 minutes covered, and then 10-15 minutes uncovered. This looks absolutely delicious! I’m wondering if it would work to add fresh cranberries and toasted walnuts to the mix? And if so, when should I add them? Hi Jenny! If you are mixing in fruits and nuts, you will want to fold those in after the first rise. Flour your work surface and place dough on surface. Sprinkle with cranberries and walnuts and then lightly knead 2-3 times to mix fruit and nuts into dough. Then shape into a ball and cover again and let rise another 30 minutes to hour before proceeding with baking. And be careful not to crush the cranberries–you want very little juice mixed into the bread as that will add moisture and change it’s structure. In fact, dried cranberries may be a better option (but I understand wanting to try with fresh!) Enjoy! Kristen– I’m perplexed about something. 2 cups water, 3 3/4 cups whole wheat flour. Two cups of water weighs 473g (grams). According to the King Arthur Flour chart at https://www.kingarthurflour.com/learn/ingredient-weight-chart.html 3 3/4 cups of flour at 113g/cup weighs 424g. So the weight ratio of water to flour is 473/424, or 112% hydration the way that pro bakers talk. That’s an *extremely* wet dough. 100% hydration is so wet that the dough is very hard to handle. Your pics, and the glowing recipe reviews, don’t indicate such a wet dough. So, I’m puzzled. I understand how this may confuse you. This is a very wet dough, but it bakes up perfectly every time for me. If I feel it is too wet, I simply sprinkle with a bit of flour before shaping into a ball. I hope you give it a try. Flour your hands before handling. I’ve made this using another formulation of flour and water and it was absolutely delicious. Very, very sticky. I’m looking forward to trying this with whole wheat flour. My husband, who’s from England said this is (type) is the best crusty bread he’s had since he’s been an American citizen…and that’s been 18 years. 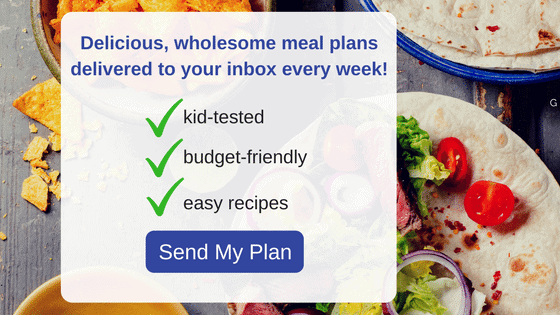 🙂 I’m so delighted that your version offers whole wheat and I’ll certainly be mixing a batch tonight. 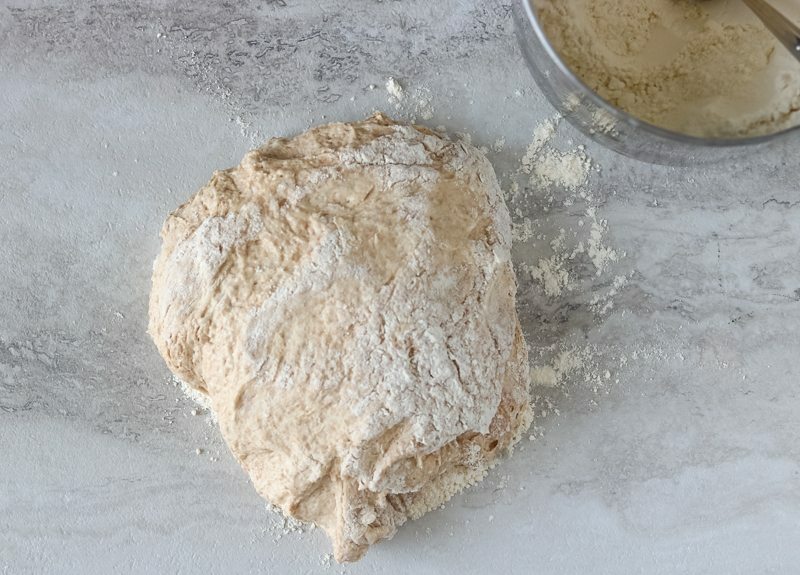 This is a very sticky dough, but with a pastry knife, a little extra flour sprinkled around the boule’ and softly floured hands – it rolls just perfect. Hi Kim! I hope you enjoy this whole wheat version! And yes, very sticky–but great tips! Thank you! My bread was glued to the bottom of the Dutch oven. You don’t grease it or anything, right? The bread tasted great!! Hi Beth! I am glad you enjoyed the bread, but sorry it stuck to the bottom of your dutch oven. Did you shape your dough on a floured cutting board? That extra flour should have helped prevent your bread from sticking. I have a stainless steel Dutch oven. Will this work? Hi Shirley! It absolutely will work 🙂 I hope you enjoy your bread! Hi Kristen, I just want to verify that this dough does not require a second proofing. Thank you! Hi Jen! That is correct. The overnight proofing is more than sufficient. Enjoy! Can I proof the dough in my INstant Pot for 4 hrs and then into the dutch oven? I made the bread yesterday. If you have an Instant Pot Duo 6 or 8 with a yogurt button you can raise any bread dough in it. Pam the metal insert pot and put the dough directly into it. Press the yogurt button, set it on low and the time on 4 hrs. It turned out great. My husband loved it too. But the crust is so hard I have a difficult time cutting it w/o tearing the bread. I use a serrated knife. What do you suggest? BTW our favorite Instant Pot roast is your Horseradish Roast recipe.